Friday I finally went under the needle to get started on my chest piece. This was long overdue because when you're friends w/ the tattoo artist its way harder to come to agreements on what would be a good design! So we literally went back and forth for damn near a year on various ideas. Last month I FINALLY got him to agree to an idea for a chest piece.. WHEW! If you're in the 757 area then hit my boy Tanane Whitfield at Studio Evolve in Va Beach. 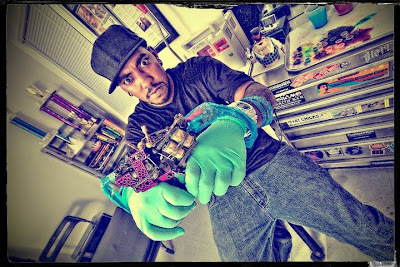 He's official with that tattoo gun!